If you have siblings that are currently sharing a room, then there will come a time when they want to be on their own. Converting your attic into a spare bedroom could be the solution you are looking for. As for deciding who gets the new bedroom you can always rely on the old coin toss. By its very design, an attic is cut off from the rest of the house. You can use that to your advantage by creating a quiet space all your own. Once you put up your drywall, fix the flooring and paint the space it could become nice little reading nook. Kids need a safe place to play. They also need to place where they can keep all of their stuff. The attic can become their playroom. As they get older, it can evolve into their hang out. Whether you have a job that allows you to work from home or you’re starting up your own business, you need a place that can work as an office. Sharing a dining room table or kitchen counter with the rest of family just isn’t going to cut it. Your converted office can be the perfect home office with plenty of room for storage. If you or someone in your family is the creative type, then perhaps the attic can become an art studio. It might help to bring in some more light with a window but that’s an easy fix that will add great value to the room. 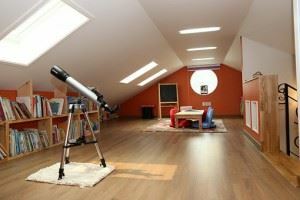 Before any of those attic conversions can happen you first need to get rid of all the clutter you have up there. Junk King Chattanooga is the perfect partner for this type of work. They’ll dispatch a team of professional movers who will make as many trips up the attic stairs as needed to get rid of all your unwanted clutter. You just need to point to all the things you want removed and Junk King will whisk it away. The first step for your attic conversion is a call to Junk King Chattanooga. This entry was posted in Chattanooga Junk Hauling and tagged attic, Junk King Chattanooga, junk removal, rubbish on June 30, 2017 by Junk King. Last updated June 30, 2017 .